After writing Can You Actually Recreate Real Mario Levels in Micro Land? I found myself unsure of what to collect. I was disappointed that a big part of Micro Land’s appeal was basically ruined for me. So I have been thinking what can I actually collect easily right now and what will make a nice display. Ultimately, I decided that the Wind Waker sets are the best thing to collect. It took a month or two, but I’ve finally come around and will be collecting and reviewing them. So to begin the review, let’s take a look at the different parts this Playset comes with. 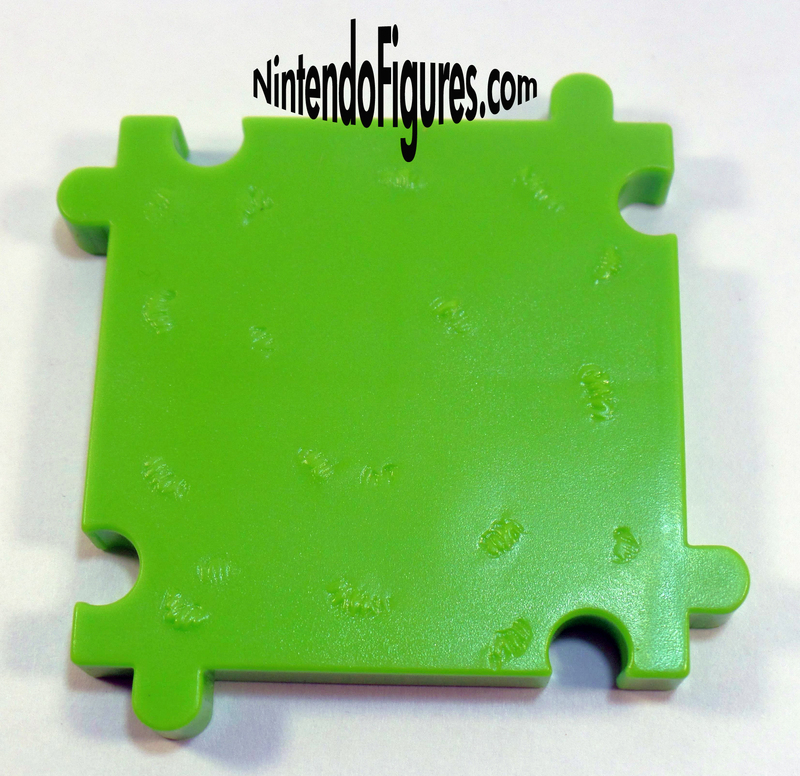 Flat Tile – In the few reviews of the Zelda Micro Land Playsets I have seen, many people complain about the “blank” tiles. I actually like these quite a bit for a couple of reasons. Zelda is a big open world and these tiles help show that. They also have a new texture to them which kind of recreates the clumps of grass in Zelda. I would have liked to see some actual clumps instead of just small bumps in the tile, but if you’re going to show what Outset Island looks like you need to show its size and a couple of tiles like this can help you do so. 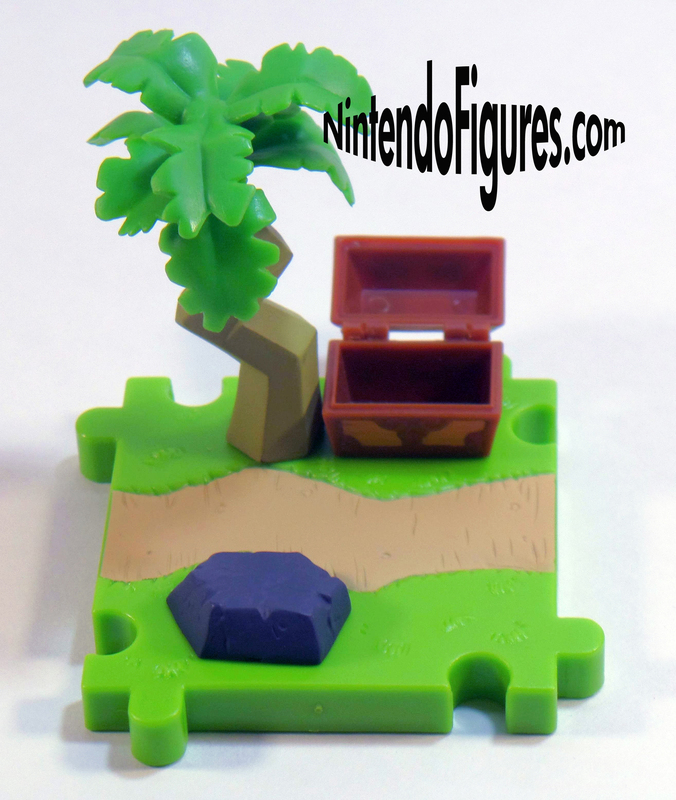 Treasure Chest and Tree Tile – This piece has a lot going on which is very welcome. The rock and tree both look nice and have more texture than some of the earlier Micro Land Playsets which is much appreciated. The chest opens which is one of the play mechanics of the set. It is pretty underwhelming as a toy, because there is nothing to put into the chest, but I suppose that is where imagination should come in. The bottom of the tile has a path with nice texture and some more of the grass clumps too. All in all, I think this piece looks really nice. House Tile – The house not only has excellent detail and really matches the houses in Wind Waker but it also has an opening door so you can put a figure inside or emerging from the house which is a nice touch. Much like the previous tile, I think this one is well done with the texture and paint. My only complaint is that the path emerging from the house is way wider than the path on the Treasure Chest and Tree Tile so they don’t match like they probably should. Maybe there is a good reason for this, but unless this addressed in the Deluxe Playset, this is disappointing. 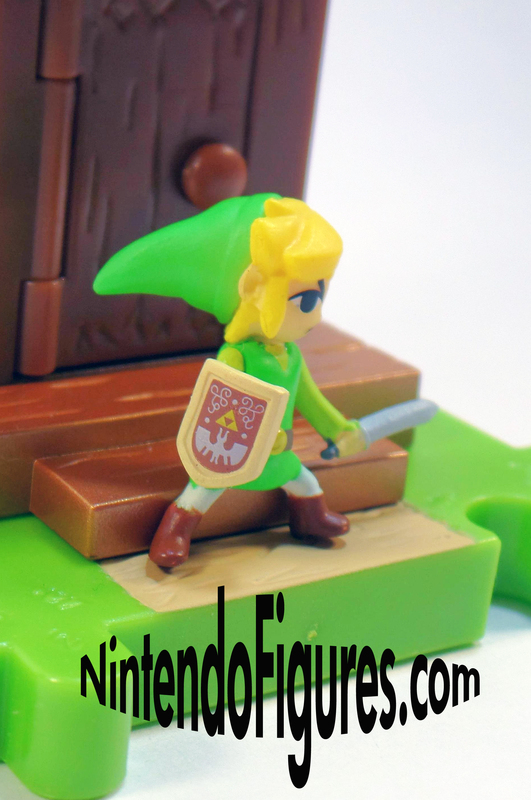 Link Figure – One of the things that persuaded me to buy one of these Wind Waker sets is the better paint quality on the figures. I have to say, this is the best looking figure I have ever reviewed on this site Link not only has nice detail, but no real errors except for one tiny mark on the face. Even his eyes look perfect and his shield has remarkable detail for a figure so small. While the paint is fantastic, the one disappointment is that Link has trouble standing like Toad (which is why in the pictures he is leaning against something to help him stand too). His sword is pretty thin and could be bent or broken easily so that is definitely something to watch out for. Display Possibilities – These three tiles make a decent scene all on their own though perhaps Link with a sword doesn’t fit Outset Island really well, but that is okay because he will work almost anywhere else. Jakks Pacific shows a potential display on the back and I have to say, adding the Deluxe Playsets will look much nicer than just throwing the three regular playsets together like in the picture. Closing Thoughts – One of the big questions I have been thinking about when reviewing this set is: is Micro Land getting better, worse, or staying the same? Based on this playset, I think they’re improving the paint and texture quality on figures and tiles. 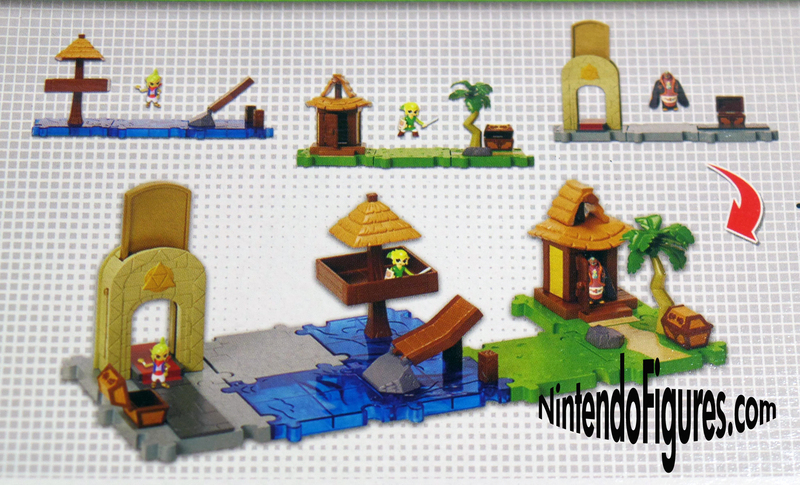 This set is really well-made and while I do see areas where it could be improved and I don’t know that this is a great toy for kids, I’m really happy with this set and will be buying more Wind Waker Micro Land sets in the near future. 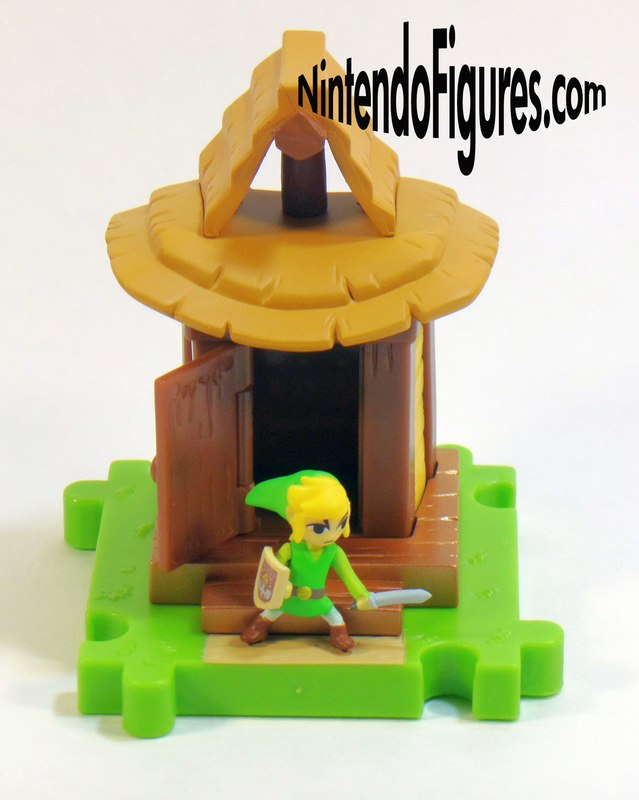 If you’re a fan of Zelda or Wind Waker, I think this playset is worth the money and you will enjoy messing around with it, even if the Wind Waker playsets are relatively simple and less interchangeable than the Mario sets Jakks Pacific has made. Previous What are Nendoroids and Why Collect Them?